Picketts Ridge won his fourth race at the Riverton meeting on Sunday and Gore trainer John Ryan realises he's going to have to travel with him. The Skyvalley gelding, owned by Ryan and Tony and Philippa Holland is now rated R75 and his days of racing consistently in the province may be numbered. "He's going to get handicapped out of it shortly. We won't be going to the Cup meeting or anything like that. We may have to take a wee trip up there at some stage to see how he can handle those trotters," said Ryan after the five year old came off 30 metres to beat King Cassidy by a head in the Neville Cleaver Fishing Aparima Handicap Trot. Picketts Ridge, in only his second season of racing is one of the province's most promising squaregaiters. At the end of last season he was starting to show his qualities and the rate of improvement has continued this season. "He's developed a wee bit more. Last year he couldn't handle a 1000 metre track. At his first start at Gore he'd just break round the corners but that was also because he was recovering from injury. Last season we stuck to the big tracks." Ryan says he's trotting a lot better this season and is more relaxed on race day. "This season he's working 10 seconds quicker on the Gore track and he's handling the bends a lot better. He's had three runs on a 1000 metre track now...... I'm real happy with the way he comes to the races. He goes to sleep in his stall and is more relaxed about it all." Driven by regular driver Nathan Williamson, Picketts Ridge settled midfield early before following King Cassidy forward with just over a lap to run. At the 550 metres mark King Cassidy took over from pacemaker Grace O'Malley with Picketts Ridge up challenging. King Cassidy and Picketts Ridge set down to fight out the finish and there was a head between them at the line. "He (Williamson) said he didn't trot as good today. I put it down to leaving the old shoes on. I should have perhaps reshod him. It's been a bit of an experiment in the last couple of weeks. I went from a mid weight heavy shoe with him to aluminiums and he won two races. The old saying is weight takes away the speed. He's handled the transition (shoe changes) well in that respect," stated Ryan. Ryan is a dab hand with trotters, he previously trained ten win mare Golden Gate. "She had sheer speed. I'm not sure whether he'll get to that speed but he's only had ten starts." Sunday was a good day for Ryan with Golden Gate producing her first foal at Macca Lodge - a colt by Love You. "I got a photo from Brent (McIntyre). The mare's looking happy and the foal looks a bit bedraggled." Meanwhile it was a good day for good mates Alan Lindsay and Cleland Murdoch. 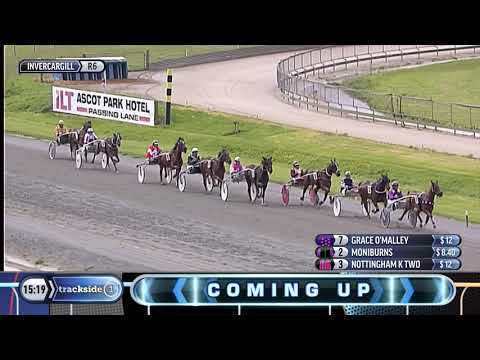 The Invercargill based owners who have a share in quality pacer Swamp Major won with separate horse yesterday. Zenola's Art at odds of 14 to 1 won the Ryder Plumbing and Roofing Mobile Pace for Kirstin Barclay and Paul Ellis, while in the next race Triple VC owned by Murdoch and the Fanny Allen Trust overcame recent bad luck when he won the SBS Bank Mobile Pace. Ryder Plumbing principle Trevor Ryder also bred and shares in the ownership of Swamp Major.